Fantastic UK quad for Billy Wilders One, Two, Three. A very rare format for the title and one with some of the best artwork. Actual size of poster is 30 x 40 inches (31 x 40 7/8 inches including linen-backing). Prior to linen-backing the poster had some extra creases, some tears, pin-holes and general wear. It has been expertly linen-backed and touched up and now displays excellently. For further details or information on backing or framing of this poster please see our website Orson & Welles. 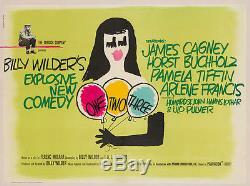 The item "Original One, Two, Three, UK Quad, Saul Bass, Linen Backed, Film/Movie Poster" is in sale since Wednesday, October 7, 2015.